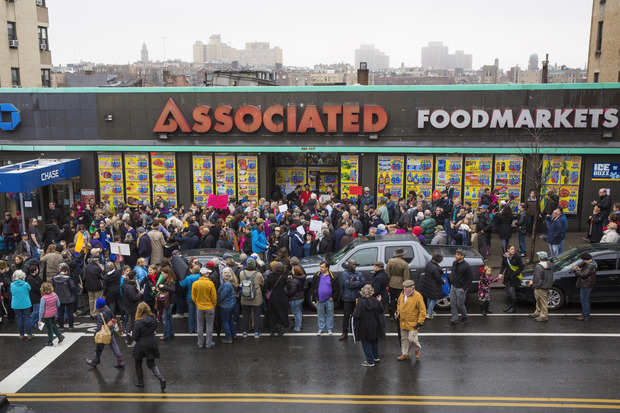 HUDSON HEIGHTS — More than 100 people rallied outside the Associated Supermarket on Fort Washington Avenue Sunday to protest the planned closure of the longtime grocery store. The lease for the supermarket, which has served residents of the community for more than three decades, expired on Jan. 1, three years after the building's management company told the franchise owner it would not renew. Instead, management opted to rent the 592 Fort Washington Ave. space to a Walgreens without giving franchise owner Oswald Rodriguez "a chance to work out the lease," he said. Neither Walgreens nor the management company have confirmed the lease, but elected officials nonetheless took the chain to task on Sunday. “You as an entity, you have other stores,” said Manhattan Borough President Gale Brewer, who attended the rally along with Councilmen Ydanis Rodriguez and Mark Levine, state Sen. Adriano Espaillat and Public Advocate Letitia James. She added that she spoke to senior management at Walgreens and asked the company not to take the space. Rodriguez worked with Community Board 12 to launch a series of petitions opposing the move, gathering more than 1,000 signatures in just two days. Board chairman Shah Ally said the number of signatures was closer to 3,000 as of Sunday afternoon, and the board will present them to the building's management office and Walgreens this week. He noted that 45 percent of shoppers at Associated are seniors, several of whom have publicly voiced concerns to the board. Paul Ross, who has been living in the community for 32 years, said if the supermarket closes he’ll be faced with “impossible choices” when it comes to grocery shopping. “(Walgreens) should just find another location," Ross said, noting that he’s not against the drugstore chain, but thinks it doesn't belongs in the neighborhood. The building’s management company, Benenson Capital Partners LLC, filed eviction proceedings against Rodriguez last week with a court hearing set for Monday morning that the supermarket's supporters planned to attend. An Associated spokeswoman previously said the company has been providing Rodriguez with business and legal support through the lease process. Benenson Capital Partners has declined to comment, citing the legal proceedings. Walgreens' representatives also declined to comment.